Understanding the mechanisms and impacts of biological invasions remains crucial to preserving marine biodiversity and biocomplexity. Invasive species may consume, outcompete or hybridize with native species, resulting in the loss of native biodiversity or even alteration of ecosystem processes (e.g. Vitousek, et. al. 1997). The invasion of coastal ecosystems by non-native species is now widely recognized and continues to take place at apparently increasing rates (Grosholz & Ruiz 1996). Alien macrophytes have invaded local marine habitats around the world, but they have been little studied in comparison to marine animals. Over 60 macrophyte species are believed to have invaded the Mediterranean, 28 along the Atlantic coast, 21 in New Zealand (Ribera & Boudouresque, 1995), 18 in Hawai‘i (Russell, 1992), as well as invasions in Southern Australia and Brazil (Ribera & Boudouresque, 1995). The ecological and economic impacts of most of these invasions remain unclear, but large impacts have been documented for some species. 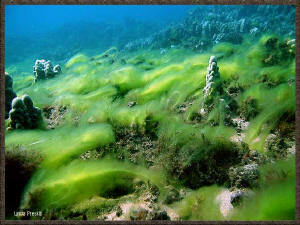 For example, beach drift of 20,000 lbs/wk has been reported for Hypnea musciformis in coastal Maui with >50% cover estimates in places where it attached; in the Mediterranean, Caulerpa taxifolia displaced the native late successional seagrass Posidonia oceanica as the algal spread at about 50km/yr (de Villele & Verlaque, 1995; Ribera & Boudouresque, 1995; see http://www.botany.hawaii.edu/invasive). While most introduced species do not become invasive, those that do can have enormous ecological and economic impacts. If invasive marine macrophytes can be identified based on morphological features early in the cycle of their introduction and spread, then costly algal invasion could be minimized by preventing deliberate introductions of these species or by eradicating accidental introductions of likely invaders before they can spread A quick review of weedy algae (http://www.botany.hawaii.edu/invasive) indicates that invasive species are found in all macro algal groups and in all functional morphologies from fast growing blades to late successional species with complex tissues. Based on anecdotal information, many weedy tropical species seem to exhibit similar features or competitive strategies: abilities to fragment readily, to regrow whole plants from fragments, to phenotypically adjust photosynthetic performance to a wide range of ecologically relevant factors such as irradiance gradients, to build morphologies that allow for exclusive use of nitrogen from novel sources and allow for rapid growth even under apparent oligotrophic nutrient conditions. The validity of these observations is difficult to assess because few quantitative data are available and comparisons with non-invasive native species of comparable functional form groups are only now being made. Recent publications (e.g. Abbott, 1999) have demonstrated that invasive species can be successfully identified based on specific characters in the majority of cases. The early detection and management of alien species are our most powerful tools to "stem" the impact of alien algae in Hawaiian coastal communities. Bibliography: Abbott, I.A.1999. 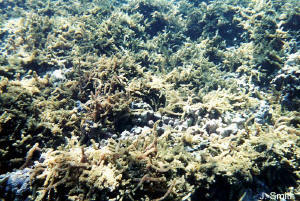 Marine Red Algae of the Hawaiian Islands. Bishop Museum Press; de Villele, X. & M. Verlaque, 1995. Botanica Marina, 38:79-87. Doty, M.S. 1961. Pacific Science. 15:547-52. Grosholz, E.D. & Ruiz, G.M. 1996. Biological Conservation, 78: 59-66. Ribera, M.A. & C.F. Boudouresque, 1995. Progress in Phycological Research, 11:187-268. Russell, D. 1992. ICES Marine Science Symposium 194:110-25. Vitousek, P.M., C.M. D'Antonio, L.L.Loope, M. Rejmanek, R. Westbrooks. 1997. New Zealand Journal of Ecology, 21:1-16.